Spud and I tried out a new permission spot today and had some luck. Took a few photos to commemorate. We bagged Spud's First Greenhead and he was excited. We were able to jump shoot it off a pond on the property. Next He pointed that Rooster, head high and intense. I approached from the front and nothing flushed. We were right at the edge of where the weedy CRP butted up to a corn field I did not have permission to hunt. 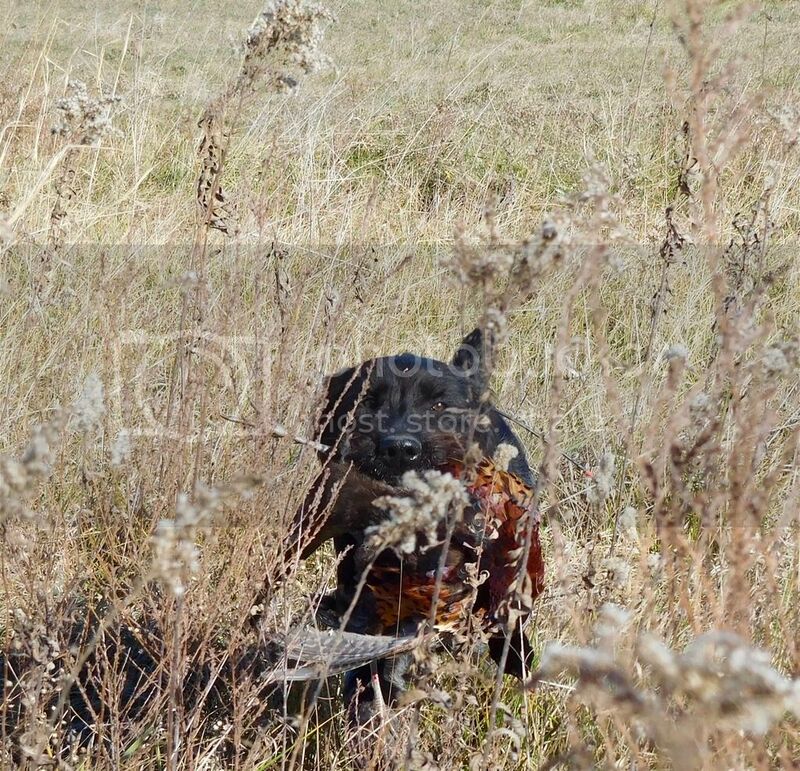 Spud was pointing into the wind and I was sure the rooster had run into the wind and further into the weedy CRP. 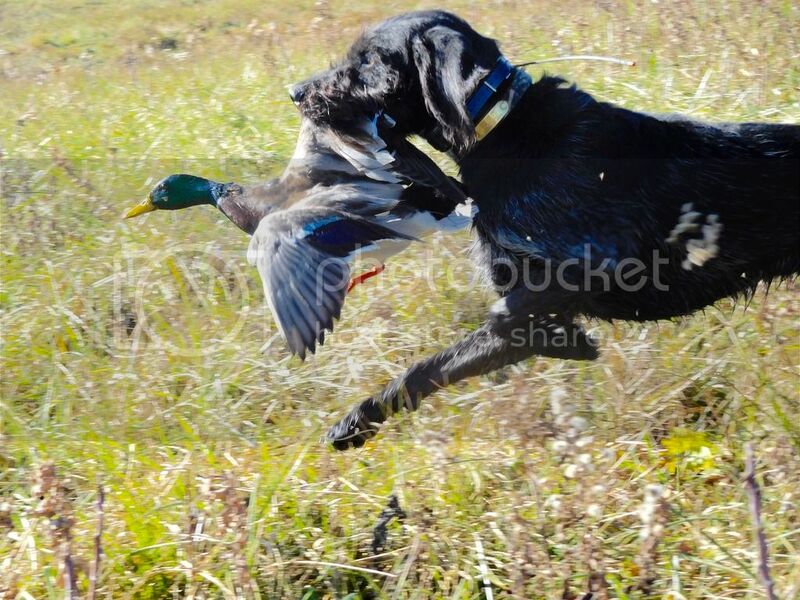 When nothing flushed Spud broke and worked down wind very excited and searching for the bird. 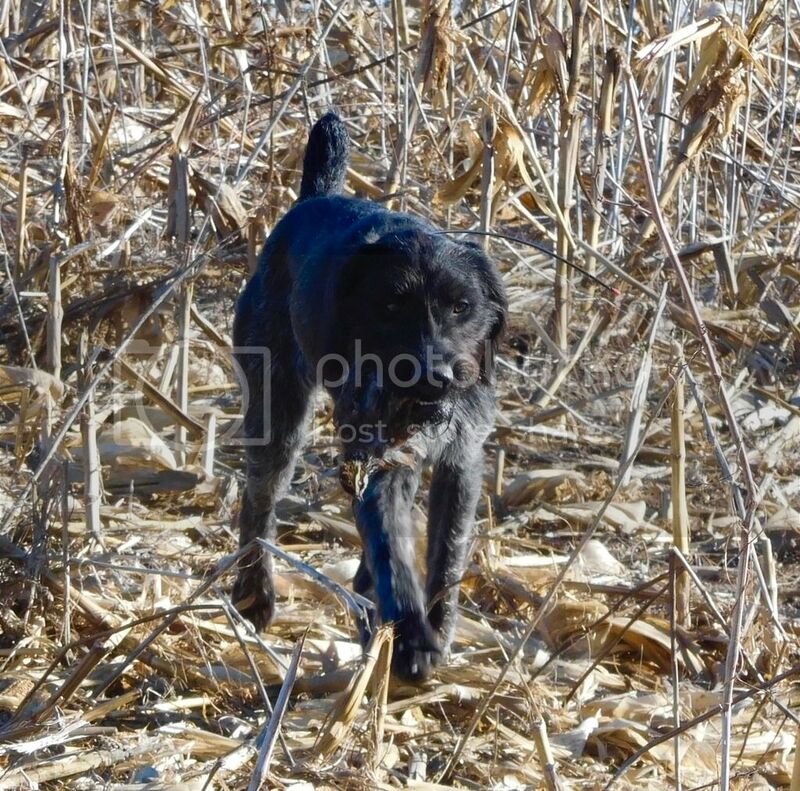 I was sure he was working the scent where the bird had been feeding in the corn field and was wishing he would move forward into the CRP cover instead. About that time the rooster lost its nerve in the corn stubble and flushed flying towards me. So once again the dog was right and I was wrong, a lesson I have to relearn periodically. As we were hunting back to the truck I noted a plum thicket at the edge of the grass and the corn field. Headed towards it. Spud got birdy on the scent from the feeding covey of quail, worked around and went on point. A nice big covey flushed more to my left than I was expecting. I was able to swing around, shot once and bagged one bird as the covey made its escape across the property we did not have permission to hunt. Spud is a wiggle worm when trying to take photos at the end of the day and that photo shows his personality. That pup sure is well on his way. 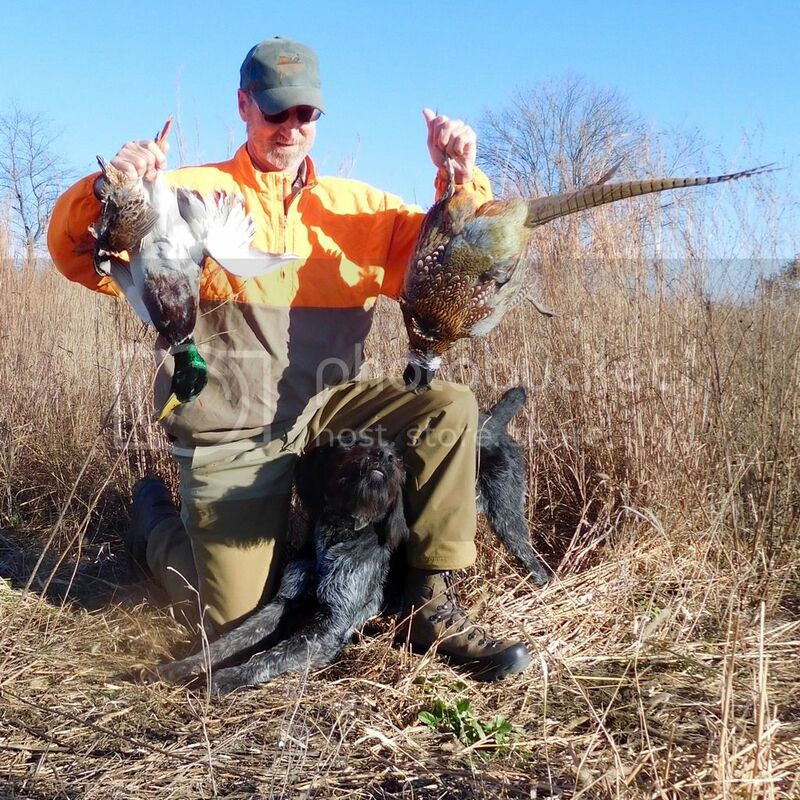 Great mixed bag for sure! Trust the dog. I still periodically have to tell myself that after I screw up. mtlhdr wrote: That pup sure is well on his way. Great mixed bag for sure! Trust the dog. I still periodically have to tell myself that after I screw up. Spud got his first 3 bird limit today. The roosters were of course moving around a bunch but Spud got each of these pointed and allowed me to take a 3 shell limit. 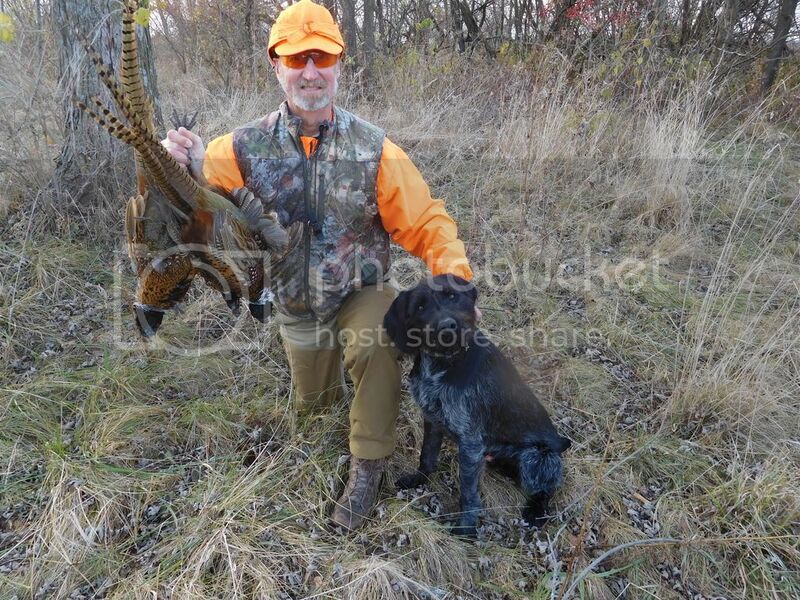 He tracked/pointed numerous hens, a covey of quail and tracked/recovered a broke wing runner for my buddy as well. He is a work in progress but he thrills me when he is into birds. Looks like you've got a bonfire hunter on your hands! Keep it up! That's some great photos and a great pup. No doubt you have an exceptional pup. Nice work! That's a real nice dog you've got there. Thanks for sharing with us.